This striking bimini top and cockpit enclosure was custom designed and fabricated for this boat. A professional marine canvas fabricator will custom-fabricate your cockpit enclosure, screen enclosure, or any other type of screen or glass (isinglass) cockpit enclosure for your powerboat or sailboat. For protection against the elements when severe weather hits, and for protection against mosquitos, no-see-ums and other annoying insects, custom-designed cockpit enclosures and screen and isinglass enclosures will give you the protection you need when you need it. No-see-um screens are used for screen enclosures, and easy-on/easy-off zipper and snap attachments are used for all types of enclosures. 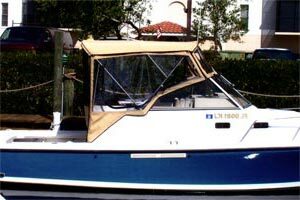 A quality marine canvas shop can fabricate and install a full canvas and isinglass cockpit enclosure, companionway and hatch screen covers, or any other type of enclosure you might need. Any good canvas enclosure shop will use high-quality marine canvas such as Sunbrella, and will fabricate the enclosure with sturdy frames and canvas reinforcements where needed. Snaps or turn fasteners should be spaced properly to securely fasten the enclosure, and should easy to reach and easy to operate. A custom-designed enclosure can be made exactly as high as you want it to be, within any limitations of booms or other overhead gear. It can be designed around your boat's winches, cleats, rod holders, baitwells, and other equipment. It can be specially designed to provide easy access to lines and sheets, and can include any removable zippered panels you may desire. You can expect to pay a premium for a custom cockpit enclosure over a ready-made enclosure, but most boaters find that the benefits and conveniences of their custom enclosure is well worth every dollar.